After driving to your camping holiday destination or enjoying some of the fun activities in the Byron Bay area, everyone likes to plop down in a comfortable seat to gather around and chat with their fellow campers – perhaps even enjoy a drink or two. So with the importance that camping chairs hold, we decided to gather a list of some excellent choices to make when looking for camping gear. An ISPO Award Winner for 2013, 2014 and 2015, this chair should be part of any cool camping gear guide. The Helinox Chair One provides both comfort and easy grab-and-go ability. The chair only weighs .9kg but can support up to 136kg, due to the aluminum-based alloy used in the poles. Plus, the self-locating poles automatically lock into place, so you just put on the mesh cover and you have a seat. Also, another excellent feature is how compact it becomes when collapsed – no more than the size of a shoe. Purchase this addition to your camping gear through the Helinox online camping store or other retailers such as Amazon (as with all of our listed chairs). If you’re looking for the most comfortable chair – that you and your mates may even fight to get to first – then check out the Eureka Curvy High Back. You can actually rest your head on this one, as well as enjoy the foam-padded armrests. It also features padded ventilation, so if it’s hot, you’ll still be able to relax in this super comfy chair. The Eureka wouldn’t be part of our cool camping chairs guide if it didn’t have excellent features, such as two storage compartments (neither is a good option for beer or soft drink cans, but the smaller one can accommodate water bottles), durable steel frame (about 102kg weight capacity) and being easy to pack and unpack. 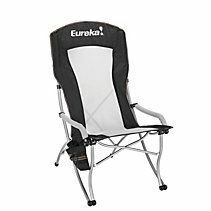 The chair retails for $79.99 and easily bought through Eureka’s online camping shop. This chair, priced at just $28, is not only economical but also an excellent choice due to its many accessories. From an armrest cooler and a cup holder, to a mesh pouch for even more storage, the Coleman Oversize Quad is a sure bet. Obviously comfort is one of the highest priorities when picking out your camping gear, and this chair serves that purpose as well. It weighs about 11 pounds and packs up to about a fourth of its size. But it’s really that built-in cooler that makes it part of this cool camping chair round up since you can easily store five beers (or other cold beverages!) and ice. Plus the price makes it easy to purchase more than one which you can do through Coleman’s online camping shop. Featuring a cool adjustable lumbar support strap, this chair allows the user to customise the perfect comfort level. That level of personalization is not something you normally get with camping gear. Also, the user may lean on the solid armrests to get up, yet another rarity and one of the reasons we added this to our cool camping chairs list. More fun features include two insulated cup holders, a headrest (that can be made extra comfortable by storing the carry bag in it) and a heavy duty steel frame (supports up to 150kg). This chair weighs about 7.2kg and packs and unpacks easily. One reviewer wrote that he and his wife love their King Kokoda chairs, but they never get to use them because fellow campers always nab them first! These ultra-comfortable chairs cost about $90 and can be found through Oztent’s online camping store. Lots of people like to camp in more than just the warm seasons so, rather than packing up a bunch of blankets, consider treating yourself and perhaps a loved camping partner to this heated seat. Using a rechargeable battery, the Chaheati chair provides a button in which you can pick one of four heat settings (and it heats up fast!). The battery lasts up to six hours, so you don’t have to worry about it shutting off while you enjoy a cool evening hanging out with your camping mates. And no need to worry where you’ll put your frosty beverage, there’s a cup holder on this chair too. Buy this cool camping chair for $89.99 through Chaheati’s online camping shop. Spend your next camping holiday with us at Broken Head Holiday Park where you can explore the entire Byron Bay area easily. Whether you pick a traditional camping site (powered or unpowered) or decide to go with one of our beach shacks, Broken Head Holiday Park makes the perfect spot to set up your cool camping chair.